You'll need to grab it from Origin before June 28. As a sort of lead-in to the launch of Battlefield 1, EA has announced that it will be making select BF4/Hardline expansion packs free for a limited time. 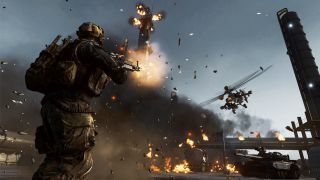 The first of these is Second Assault for Battlefield 4, which contains four maps from Battlefield 3, maps that have been "updated with the power of the Frostbite 3 engine". Here it is on Origin, but if you're into procrastination, be aware that it's only free until June 28. After that it'll be yours to keep, however. I wouldn't have thought that such an occasion calls for a trailer, but who am I to dictate EA's marketing policy? Here's a reminder of what Second Assault contains. Prepare to be a little bit sick when you see the word 'levolution'. Four new maps: destroy the ceilings of the flooded Operation Metro. Bring down the communications tower of the new Caspian Border. Create flammable hazards on Operation Firestorm and dodge Gulf of Oman’s sand storm. Second Assault pushes the fan-favorites to their limits.